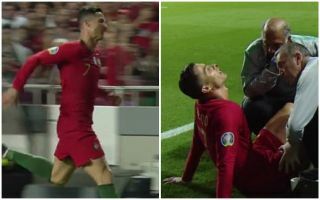 Juventus have been handed a real injury concern after Cristiano Ronaldo limped off in Portugal’s clash with Serbia on Monday night. The 34-year-old has been in fine form so far this season for the Bianconeri, scoring 24 goals and providing 12 assists in 36 games. He was rested by coach Massimiliano Allegri prior to the international break against Genoa, but it appears as though that hasn’t helped him get through it without picking up an injury. As seen in the images and video below, coupled with Tuttomercatoweb noting that it appears to be a hamstring problem after he attempted a sprint in the 30th minute, that will undoubtedly be a huge concern for the Italian giants now. While they are comfortably clear in the Serie A title race, given that the Champions League returns in two weeks time when they travel to Amsterdam to face Ajax in the first leg of their quarter-final tie, the last thing that they need is to see their talisman ruled out with an injury. It’s a concern for now, and they will be anxious to get back him to Turin to carry out further tests and scans to evaluate the extent of the issue. Nevertheless, hamstring problems can be tricky and so they will have to be cautious to avoid aggravating the problem further, with question marks now likely to be raised over his availability for clashes with Empoli and Cagliari in the coming weeks.